In newer systems, there is often an effluent filter: one of the significant improvements in septic tank design in decades. They range from 4 to 18 inches in diameter. 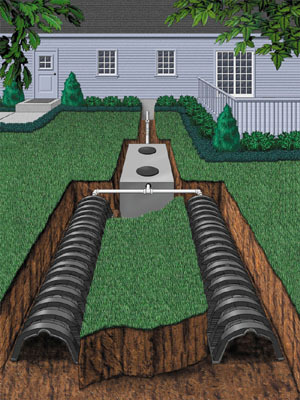 As we have described, the most serious problem with septic systems is the migration of solids, grease, or oil into the drain field, and the filter is effective in preventing this. A filter restricts and limits passage of suspended solids into the effluent. Solids in a filtered system's effluent discharge are significantly less than those produced in a non-screened system. In 1907, W. P. Dunbar conducted tests on the decomposition of vegetable and animal matter in septic tanks. He stated, "The author has investigated the subject by suspending in septic tanks a large number of solid organic substances, such as cooked vegetables, cabbages, turnips, potatoes, peas, beans, bread, various forms of cellulose, flesh in the form of dead bodies of animals, skinned and unskinned, various kinds of fat, bones, cartilage, etc., and has shown that many of these substances are almost completely dissolved in from three to four weeks. They first presented a swollen appearance, and increased in weight. The turnips had holes on the surface, which gradually became deeper. The edges of the cabbage leaves looked as though they had been bitten, and similar signs of decomposition were visible in the case of other substances. Of the skinned animals, the skeleton alone remained after a short time; with the unskinned animals the process lasted rather longer. At this stage I will only point out that the experiments were so arranged that no portion of the substances could be washed away; their disappearance was therefore due to solution and gasification."